84 of Indianapolis, Indiana passed away April 11, 2019. She was born to the late Frank J. and Marie L. Rikhoff Roth on June 17, 1934 in Indianapolis, Indiana. She was a Registered Nurse graduating from St. Vincent's School of Nursing in 1955. She married Joseph Francis Doerr on Sept. 7, 1957. 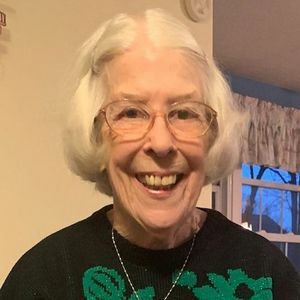 A member of Nativity Catholic Church, Barbara was involved in many church and school activities, including Boy Scouts, Girl Scouts, CYO activities, One- Act Play Director, Kickball Coach, Organizer for Blood Drives, Eucharistic Minister Coordinator, and Scripture Study Facilitator. Barbara was preceded in death by her husband Joe, her daughter Janet and granddaughter Angela. She is survived by her children Joe (Becky), Jim, Jean Schott (Kevin), Kathy Sauer (Joel), and Carol Hefner (Matt), ten grandchildren, and four great-grandchildren. Visitation is scheduled for Sunday, April 14, 4-8 p.m. at Wilson St. Pierre Funeral Service & Crematory, Franklin Township Chapel, 5950 E. Thompson Road. A Mass of Christian Burial will be 10:00 A.M. Monday, April 15, in Nativity Catholic Church, 7225 Southeastern Ave. in Indianapolis. Burial will be in Calvary Cemetery. In lieu of flowers, donations may be made to God's Bounty Food Pantry or the Cystic Fibrosis Foundation. Add your thoughts, prayers or a condolence to Barbara's guestbook.